Instead of performing at the Black Box or Bolton Theater, dancers, poets and patrons ventured to the Kenyon Athletic Center (KAC) last Saturday night for an event called “The Neutral Corner.” In the middle of the Multi-Activity Court (MAC) stood a boxing ring, which became the stage not for boxing, but for contact improv and hard-hitting poetry. This one-time event was intended to provide a place for members of the Kenyon community to confront issues of race, class and identity. Cheryl Pope, a artist-in-residence at Kenyon last semester, partnered with the Gund Gallery to produce the event. She had previously collaborated with the Gund Gallery during her residency to install banners in the MAC that had statements about themes like vunerability written on them. 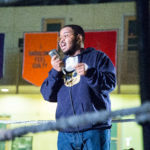 The location, the popcorn served and the energetic announcing by Jacob Adams ’19 promised this would be not just a performance, but a spectacle. The performance occurred in twelve rounds. The rounds happened in four cycles that each started with dance then went to poetry then to discussion. 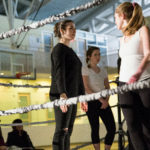 During the contact improv rounds, pairs of dancers from Assistant Professor of Dance Kora Radella Feller’s Contact Improvisation class took turns improvising face-offs. Each duo circled one another with their eyes locked, then they began to crash into each other, shoulders smashing shoulders and thighs smashing thighs. “A lot of the pieces we put together were combative, I would say,” Claire Hildebrandt ’17 said. This aggression would then escalate into wrestling. Daniel De Andrade ’19 also participated in the performance. 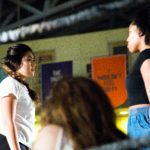 “Circling around somebody while making intense eye contact with them isn’t something you need to learn how to do but it is something you need to get comfortable with,” Andrade said about preparing for the performance. The three spoken-word poets came from a poetry collective known as Kenyon Magnetic Voices. The featured poets were Benjamin Adekunle-Raji ’17 (under the stage name VISION), Lanise Beavers ’18 and Marc Delucchi ’20. The poetry, written by the performers themselves, dealt with issues of identity, race, body politics and intersectionality. Beavers performed a poem about the detrimental effects of white-centric feminism and Delucchi performed a poem about race and sexuality. The roundtable discussions drew on the poetry performances as a starting point from which to discuss how social issues relate to Kenyon. 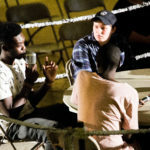 Participants in the discussions sat around a table in the ring conversing about the topics including the politics of working out at the KAC, self-censorship and understanding one’s role in promoting social change. There were some moments of disagreement between panelists, specifically over the question of whether everyone is free to be themselves at Kenyon.